Well, Christmas is a time for everything, isn’t it? It picks up traditions, customs, institutions and insanely catchy songs like a kid’s dropped lollipop picks up fluff. Don’t get me wrong; I love Christmas. Along with steaming mugs of tea, Groundhog Day, snow, excruciating puns and Yorkshire pudding, Christmas is one of my favourite things in the whole world. The only problem with Christmas is that it’s too good. All the best things in life are crammed into the last few weeks of the year. Much as I love the festive season, I would be willing to graft some of its ritual, goodwill, cheerful excess and child-like wonder into other, barer parts of the calendar. For instance, we don’t have enough films set on April Fool’s Day, St. Patrick’s Day, Yom Kippur, Armistice Day, Bloomsday or General Election Day. Admittedly, none of those occasions have accummulated much in the way of popular celebration (as I wish they would), but what are movie-maker’s given imaginations for? But no; the camera prefers Christmas trees and carol-singers and piles of sumptuously wrapped presents and the softly-falling snow that, in the world of movies, always comes with the Season of Goodwill. Christmas provides a ready-made picturesque backdrop for horrors (Black Christmas), comedies (Bad Santa), superhero movies (Batman Returns), crime movies (Die Hard) and movies about cute little critters that breed miniature monsters when you feed them after midnight (Gremlins). And of course, then there are the Christmas Christmas movies, films about the season itself. Yes, Virgina, There Is a Santa Claus, The Santa Clause series, The Polar Express, It’s a Wonderful Life, Surviving Christmas (probably the most depressing film I’ve ever seen, despite purporting to be a comedy), the five million versions of A Christmas Carol, plus a bulging Santa’s sack more. With the exception of Dickens’s great tale (surely one of the greatest stories ever conceived), I have to admit a disappointment with all the “Christmas Christmas” movies I’ve seen—even (dare I type it?) the much-venerated It’s a Wonderful Life. You see, I believe in Christmas—not just the healthy secular extravaganza of cheer and merrymaking, but the ineffable sacred mystery at its core. And what film can really rise to that challenge? Christmas doesn’t need any movies to evoke its magic. The nearest Christmas tree will do that better than any film. 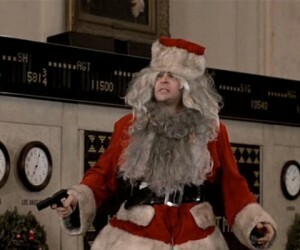 So that leaves the films that use Christmas as a background; and of these, I choose Trading Places (1983), a comedy that falls just short of classic status. 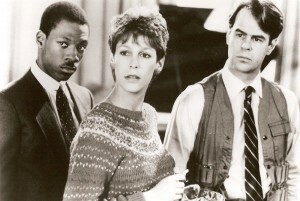 It has a simple premise; a black man from the street (Eddie Murphy, playing Billy Ray Valentine) swaps places with a young WASP executive (Dan Ackroyd, playing Louis Winthorpe), both of them unwitting guinea pigs in a social experiment conducted by the deliciously vile Duke brothers, two fabulously wealthy commodity brokers who employ Winthorpe. They have him arrested on some trumped-up charges of theft and drug-dealing, and soon the only person who will take him in is the kind-hearted prostitute Ophelia (Jamie Lee Crawford). Meanwhile, Billy Ray Valentine is moved into his palatial home and high-pressure job, where he puts his street-smarts to good use. But soon the prince and the pauper realise they are simply pawns in a game, and join forces to take revenge on the Dukes. The film’s climax actually takes place on a train during New Year’s Eve, but there is a long scene set during a Christmas party, which ends with Winthorpe wandering downtown in a Santa costume, drunk and suicidal. The use of Christmas is typical of this film’s greatest strength—almost every single scene is like a little movie in itself, a set-piece that stands on its own, with its own distinctive setting and atmosphere. One might think that could be said of most movies, but unfortunately, that’s far from the case. Far too many films have samey scene after samey scene; we may go from castle to village, but when we go back to the castle, we feel we’re treading water. The makers of Trading Places work hard to maintain variety throughout its running time, and every scenario is realised to its full—whether we’re in a sumptuous country club or a seedy pawnshop. 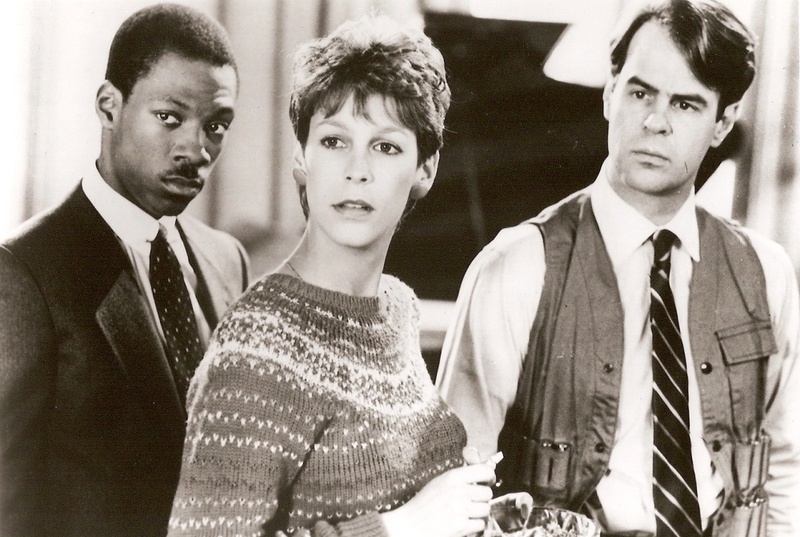 Trading Places is one of the most fully-flavoured films I know (I would give it full marks if its last few minutes doesn’t let it down so miserably) and it uses Christmas to impart some of that flavour. And after all, when it comes to movies, that is the chief use of Christmas. And it’s enough. Movies about Christmas itself have their place, but they tend to run to either schmaltz or cynicism. I prefer Christmas films where the music of the season is kept in the distance, like the faint and far-off tinkling of reindeers’ bells. A Merry Christmas to all readers of WeekedBase!